Muscovy Ducks are naturally low fat. The birds originated in South America and did not need the body fat to keep warm like birds from northern climates. The breast meat is consequently 98% lean, very tender, and ideal for roasting. 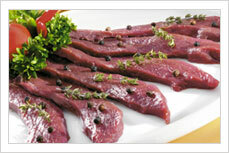 A low-fat red meat, Ostrich has a taste similar to beef, with a texture similar to venison. Because ostrich is a flightless bird, the choice cuts come from leg muscles. Our supplier insures a totally natural product from conception to consumption.